Best Day to List Your Home? The day your home is listed on the market does matter. When working with sellers, I always try to schedule the listing to go live during the middle of the week. So when I stumbled on this article that substantiates this practice, I decided to turn it into a post to reinforce this practice. This article explains that listing a home in the middle of the week allows for optimal showings and statistics show that houses listed in the middle of the week actually sell for a higher price. The timing allows the home to be included in buyers scheduled showings over the weekend and allows for timely scheduling of open houses. 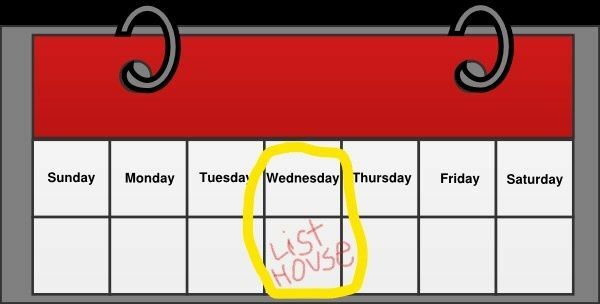 When a home is listed over the weekend or early in the week, it does not allow for buyers to schedule weekend showings. This equates to wasted days on market and statistics show that the longer a house is on the market, the lower the sales price is. When selling a home, it is ideal to hit the market running and make every day count. Want to know what time of year is best to put a home on the market for sale? Read my blogpost – When is the Best Time of Year to List a House for Sale?